The PosterMyWall integration uses Signagelive Widget Development Framework to create content that works offline on Signagelive’s range of supported players. Signagelive has announced a new strategic partner PosterMyWall which allows customers to create promotional graphics and videos without needing any design skills. 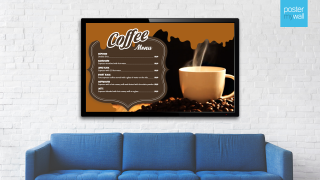 Thousands of templates can be used for restaurants, retail, corporate, events and bars within Signagelive which can be customized within minutes. Edit designs for free and have them appear automatically on screens. PosterMyWall can be easily added to the Signagelive platform, with the two companies working together to digital signage solutions to Value Added Resellers and their customers. The PosterMyWall integration uses Signagelive Widget Development Framework to create content that works offline on Signagelive’s range of supported players and SOC Displays, while enabling a change to content in a PosterMyWall asset being automatically updated without the need to republish in Signagelive.